In all fairness it should be admitted that India had given enough provocation to Pakistan to open the Western Front, and the war. Given the Indian incursions in the East, it would appear surprising why Pakistan waited so long at all, until 3 December, by which time India was all set and ready for the show. Unlike in the East, the forces of India and Pakistan facing each other in the Western Sector were more or less evenly matched. The Indian plan was basically one of defence, with the option for offensive tactics as a defensive measure. Here too there were three corps deployed under the Western Command, with two additional divisions in Rajasthan directly controlled by the Southern Command. 1 Armoured Division along with 14 Infantry Division was held in the Army Headquarters Reserve. To the north, 15 Corps in Jammu was poised to strike out from the Chhamb Area towards the Pakistani town of Gujrat with its 10 Infantry Division, while its 26 Infantry Division advanced towards Sialkot. 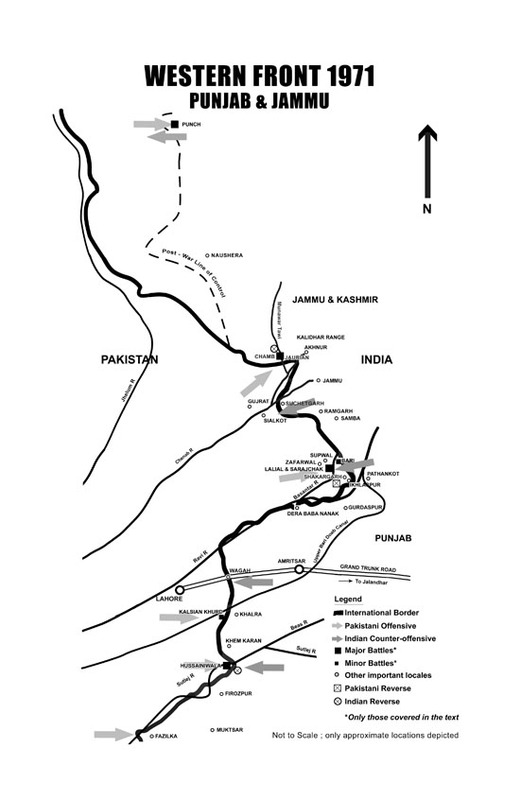 Immediately south, in Punjab, 1 Corps was to take up the advance up the Shakargarh bulge between the rivers Bein and Karir with its 39 Infantry Division, while its 54 Infantry Division advanced between the rivers Karir and Basantar, aiming to take Mirzapur, leaving a third infantry division, 36, in reserve. Further south, 11 Corps guarded the area from Dera Baba Nanak to Fazilka, its 15 Infantry Division holding the positions north of the Grand Trunk Road and 7 Infantry Division holding those to the south. In the southern-most sector in Rajasthan, under the Southern Command with its advance Headquarters at Jodhpur, 11 and 12 Infantry Divisions were deployed in the Jaisalmer and Balmer Areas. If the army’s role in the West was to be considered merely one of defence, by and large it was performed eminently, in that; every offensive undertaken by Pakistan was thwarted by our formations. We did however suffer some reverses, significantly at Chhamb, where we lost our territory west of the river Munawar-Tawi to the enemy (rather permanently, since unlike in 1965, areas captured by either side in J&K were not to be exchanged after the war), and in Punjab where they took the Hussainiwala Enclave across the Sutlej. Also, at the end of the day, the rank and file of the army was left with the nagging feeling that we certainly could have done better in our offensive operations. Except for Punch where we did remarkably well throwing back the Pak thrust and grabbing some enemy territory (though the situation couldn’t be exploited to take the Haji Pir Pass), and for Ladakh where we captured the enemy posts overlooking our line of communication; our offensive manoeuvres lacked enthusiasm. A more determined push in Punjab and Rajasthan could have brought us rich dividends. The uncomfortable fact also remained that the Pakistani offensive could not really be rated as all that high spirited. Once again, like in ’48 and ’65, they failed to match the indomitable fighting spirit of the ordinary Indian soldier. As it turned out, Pakistan ended up losers in the West as well, where they were neither outnumbered nor outgunned, as they could plead to have been in the East. They lost some 3000 square miles of their territory – 1200 in Sind, 850 in Kutch, 830 in Shakargarh and 30 on the Punjab Border. India had lost merely 50 square miles in Chhamb and Hussainiwala. Eight battalions of the Madras Regiment were in action on the Western Front, four on the Punjab Border, three in Rajasthan, and one in J&K. The 3rd, 6th, 16th and the 17th Battalions of the Madras Regiment fought on the Punjab Border. 3 Madras (belonging to 65 Infantry Brigade under 7 Division of 11 Corps), commanded by Lieutenant Colonel Jitendra Kumar, was deployed to hold the border posts in the Khalra area from October. The battalion found itself in an offensive role with the enemy thrust towards the Upper Bari Doab Canal (UBDC), as soon as the war broke out in December. It was assigned to retake the village of Kalsian Khurd by the UBDC some 400 yards from the international boundary, which had been lost to the enemy initially along with a border outpost sited there. The single platoon that could be spared – with restrictions in force on the minimum strength to be maintained for defence – under a sharp-witted JCO, Subedar Perumal Pillai, set off on the mission in the wee hours of 6 December. Pinned down by shelling and automatic fire, Pillai split the platoon into two groups and encircled the village in a two-pronged move. With timely marksmanship they knocked off the observation post of the enemy artillery and rushed the objective. The enemy fell back in panic, abandoning the village. Elated, the battalion rushed in a mobile combat team with a recoilless gun under a hardy officer, Captain K Chandrasekhar, boosted by a troop of 3 Cavalry operating alongside. By the afternoon, Chandrasekhar, now in command of the force, had established a strong defensive position in the built-up area. Before nightfall he was reinforced by a section of 3 inch mortars and two sections of BSF. The enemy counter-attacked during the night, only to be thrown back; to a great extent owing to the courage of one man, Havildar Shantayya, the Platoon Second-in-Command, who took it upon himself to enfilade the enemy assault, by opening up from the left flank single-handedly with a LMG. Through out the next day, 7 December, intense bombardment by the enemy artillery and tank fire as well as air strikes rocked the place, before they launched another counter-attack, a powerful one by two companies, during the night. Once again they were repulsed. The shelling and air strikes continued during the following day, and during that night, 8/9 December, the enemy mounted a third counter-attack. Both sides fought desperately. Enemy assault was often stopped short by bringing down our own artillery fire barely ten yards in front of the defenders, who made every small arms volley count with deadly effect by holding their fire to the last and firing with the enemy in their sights at close quarters. The position held. After this attack, though they kept the village under shelling, the enemy did not attempt to take it, and the war ended with 3 Madras still holding Kalsian Khurd. The battalion had lost 7 killed and 9 wounded, some of them mine casualties. Captain Chandrasekhar and Havildar Shantayya were both awarded the Sena Medal for their gallantry in the battle. 6 Madras, commanded by Lieutenant Colonel Ratan Singh, was concentrated in the Samba Sector at the commencement of the operations, under 91 Infantry Brigade of 39 Division with 1 Corps. 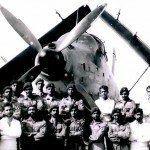 After it had successfully withstood the initial onslaught of the enemy and captured a chain of villages across the border in counter strikes, the battalion was re-allocated to join 47 Infantry Brigade of 54 Division for operations on the Punjab Border. The brigade, along with 17 Poona Horse, had been assigned to secure a bridgehead across the river Basantar. 16 Madras, also with the same brigade, led the attack by storming the enemy position successfully, late in the evening on 15 December in the first phase of the operation. 6 Madras, earmarked to stage the fourth and final phase of the attack, was moved up early next morning to reinforce 16, by now being thronged by counter-attacks. For the next more than thirty-six hours until the ceasefire fully came into effect, the battalion fought off one counter-attack after the other. A Company which was occupying the extreme right corner of Lalial, the locality to the right half of the captured objective, faced the worst, peppered constantly by aimed and effective automatic fire from close range. The Recoilless Guns Detachment Commander, Naik Jojula Sanyasi, was to turn a hero during the stand-off when in a single-handed exploit he took out an enemy machinegun. He was awarded the Vir Chakra. The battalion suffered 27 casualties in all, 6 men killed and 21 wounded, including an officer. 16 Madras, commanded by Lieutenant Colonel VP Ghai, did some of the toughest fighting the Indian Army saw in 1971. The battalion was part of 47 Infantry Brigade under 54 Infantry Division of 1 Corps, which launched the offensive in the Shakargarh bulge of Pakistan’s Sialkot district. Leading the advance from the beginning, they captured various outposts. In a memorable action in the early hours of 7 December, a combat group of one company of the battalion and a squadron of 4 Horse surprised the enemy at Bari, overrunning the post. In subsequent actions on the 10th and 11th, they went on to capture two more posts, Baher and Nakki Gujran. But the most significant battle they fought – and one of the bravest and the bloodiest by any one unit in the whole war – was at the Lalial-Sarajchak complex across the Basantar, during the two nights and two days that followed the evening of 15 December. The battalion, along with 3 Grenadiers, was assigned the task of securing a bridgehead across the river to induct tanks the following day. A two-phase attack was planned in which 16 Madras was to go in first and capture the twin features of Lalial and Sarajchak, followed by 3 Grenadiers taking Jarpal to the south of them. The enemy was well fortified in his defences in the two features, some 1000 yards from the western bank of the river. The river itself was heavily mined on either side and effectively covered by automatics’ fire, rendering it a formidable obstacle. Unknown to the attackers, yet another line of enemy defences running along a parallel obstacle to the north, the Supwal Ditch, extended almost up to Lalial, imposing a factor that would add an ominous dimension to events as the battle developed. Two companies led the attack launched at 1930 hours; Major PV Sahadevan’s C Company on the right going for Lalial, and Major CBS Krishnia’s D Company on the left going for Sarajchak. It was hammer and tongs all the way, right from the word go. The men raced across the obstacle in a hailstorm of bullets and shell bursts. The commanders of both the leading platoons of C Company had been wounded by the time the column had made it across the river. The company was being mauled by machineguns sited at the pillboxes of the Supwal Ditch, a nightmarish development no one had anticipated. Even with own artillery hammering the enemy up front and close, the going got so tough that some 400 yards short of the objective the assault almost floundered. The hard-pressed Company Commander, Sahadevan, chose to turn the enemy’s flank. He dispatched his No 8 Platoon under Havildar Thomas Philipose – the Platoon Commander, Naib Subedar Bhaskaran Nair, having been wounded and out of action – to swing off to the right and strike the enemy from up north. Philipose, a no-nonsense man with a never-say-die spirit, moved swiftly to lead a fierce flanking charge. Twice wounded and bleeding, he kept going until the platoon had stormed the troublesome bunkers and subdued the enemy; later to hold on to the captured area regardless of his wounds. Sahadevan himself, crawling up close to a recoilless gun with a handful of his men, set its jeep ablaze by lobbing a grenade. There was panic in enemy’s ranks, and Second Lieutenant PA Somaiah, following right behind with his No 9 Platoon, sensed the chance and unleashed a charge. The enemy fire withered, and the whole company pounced on the objective with bayonets. As the mortal hand-to-hand combat raged across the objective, Naik A Sahadevan, a namesake of the Company Commander, rushed an enemy machinegun in a daredevil bid and hurled a grenade to silence it. The gun indeed was silenced; so was the brave NCO, cut down by a burst that he took fully in the chest. The fighting continued for good about an hour before the enemy could be cleared off the entire objective, and the C Company’s success flare went up at 2130 hours. 14 enemy soldiers were killed on the objective; and of our own, 9 had been killed and 30 wounded. D Company, assaulting on the left, ran into almost similar opposition. Hardly had they stormed the forward bunkers, they were up against the fire from well-concealed positions in the built-up area behind. Then onwards it turned an arduous battle of flushing the enemy out from one position after the other. Krishnia, the Company Commander, went about it clinically, employing one platoon at a time in flanking moves, exercising utmost fire discipline. It was slow going; still they made it in fairly good time, and Sarajchak had been cleared by 2200 hours, just half an hour behind the C Company at Lalial. A body count in the morning gave the enemy dead on the objective as 15. Own losses were 11 killed and 27 wounded. C Company, far too close to the Supwal Ditch for comfort of the enemy there, was by now being targeted intensely by their guns. The Pakistanis, stunned by the ferocity of the assault, soon gathered their wits and launched a blistering counter-attack about an hour before midnight. They closed in employing a ruse of imitating shouts and cries of other Indian troops; but it didn’t get them far as the company rallied to take them on. Thomas Philipose, still on his feet, trumped his own exploit earlier by gathering his depleted platoon to lead a daring counter-charge. Battered badly, the enemy fell back in confusion and then fled, leaving three of their dead behind. Even as C Company was battling it out at Lalial, the second phase of the battalion attack was well under way with A and B Companies going for the next two objectives, the twin features of 5r and 6r beyond Lalial and Sarajchak. As soon as the companies had executed the intricate manoeuvre of filtering the men through ranks of the lead companies holding the captured objectives, they struck out swiftly. Major JS Pathania with his B Company on the left went for an outflanking move to get at 5r from the southwest, completely surprising the enemy, to take the objective by 2300 hours. However Major Mohinder Singh, moving on 6r from the right with his A Company, denied an outflanking option by the Supwal Ditch, had to go in for a blunt frontal assault. To compound matters, some of the enemy troops counter-attacking the C Company position at Lalial made a flanking entry to 6r, to intercede at the most dicey moment. It turned into a savage conflict wherein a resolute enemy had to be plucked out from bunker after bunker at the point of bayonets. One incident said it all; Sepoy Kotaiah who had thrust his bayonet into a Pak soldier’s belly, had had his own thigh pierced by the same adversary. And his Platoon Commander, Naib Subedar Bhagiamani, shot dead another enemy soldier point blank as he made to grab Kotaiah. The fight ended by 2330 hours with 6r being taken. 20 of the enemy lay dead on 5r and 6r. Together, A and B Companies had lost 7 killed and 32 wounded. The Grenadiers also captured their objective during the night and with the bridgehead formed, the tanks of 17 Poona Horse1 – two troops – drove in early the next morning (16 December). The enemy artillery kept pounding the position with a vengeance; and past 1000 hours, with the shelling at its crescendo, a major counter-attack was in the offing; the enemy concentrating more than a regiment of tanks and a battalion of infantry to the north. VP Ghai, the Battalion Commander, reacted fast, moving troops from Sarajchak and 5r to Lalial and 6r which were under immediate threat. A furious battle soon took shape with the enemy assaulting in wave after wave. It became one desperate contest for the battalion with the attackers surging forward menacingly close. Ghai, true to the finest traditions of the officer corps, led from the front, moving right under fire, relocating men and keeping them steadfast by personal example. The position held against overwhelming odds, until at last after two blood-curdling efforts the enemy called it a day. Their dead soldiers and smouldering tanks littered the battlefield. The battalion had paid heavily for the victory. Its brave commander, Ghai, had fallen prey to machinegun fire and shell burst; so had the medical officer, Captain Surendranath, who had made a gallant bid to attend to the fallen CO.
D P Ramachandran is a former cavalry officer of the Indian Army and a veteran of the 1971 Bangladesh War and author of the book Empire's First Soldiers.